At the beginning of May I started a four week anti-bacterial skin care routine, since starting the trial I have posted two blog posts updating you on my progress, you can read them by clicking the links below. I have completed my trial and then some, and I am lovin' the results, not only was my skin remarkably clear, any small imperfections I had laying below the skin slowly disappeared. I noticed that my skin felt taught after using the face wash, but this was soon soothed by applying the extremely hydrating serum. I initially thought the Ph of my skin had remained unaltered which disappointed me, but when I switched back to my old skin care I noticed within a day that Face B4 had combated some oiliness. 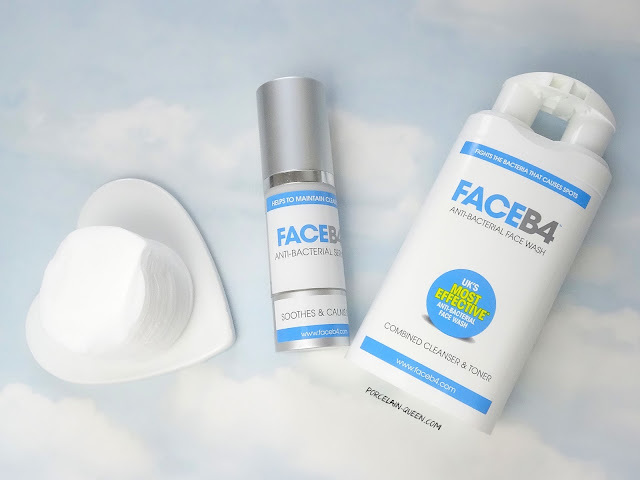 Although I really enjoyed using Face B4, I wish they offered more products, such as an exfoliator and a deep cleansing face mask. The combination cleanser and toner anti-bacterial face wash retails at £14.99, and the serum, £9.99. Or if you buy both you can save yourself £7.49.